Fly to California for skiing? Isn’t Colorado or Utah the place to go for snow? A recent trip to Lake Tahoe sure changed my view. Do you like glorious sun, gorgeous scenery, lots of ski areas and tons of snow? 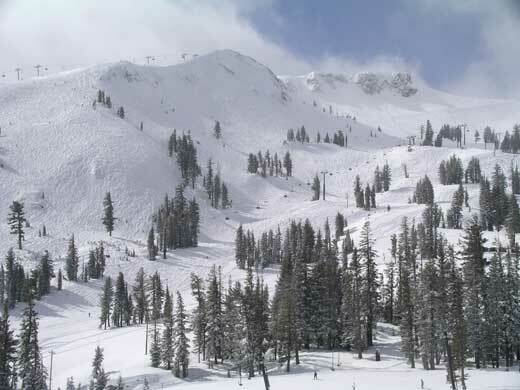 Turns out Lake Tahoe’s got all that, 300-days of sunshine, the largest concentration of ski resorts in North America, and snow measured in feet not inches, and it keeps coming – 7-feet of snow in 7-days just last week. But my reason for loving Lake Tahoe is Lake Tahoe itself, the brilliant blue centerpiece at the heart of all this sun and snow-soaked peaks. In our week out west, we skied 5 of Tahoe’s 18 ski resorts, making our way around the stunning shores of this deep azure Lake. If you prefer to settle into one resort instead of slope hopping Tahoe’s 24,000 ski-able acres, here is a bit about each of the areas we explored. Northstar was an ideal place to start our ski tour, on Lake Tahoe’s North Shore. Passing through the stunning new mountainside Village, I made note of après ski wine tasting, and ice skating for the kids on the centerpiece rink surrounded by inviting outdoor couches. From the sophisticated Village, the gondola launched us to Northstar’s 70 trails and six high-speed quads. We found Northstar the most eastern like area with trail skiing amid towering lodge pole pines, a beautiful intro to the High Sierra ski scene. A young family could stay at Northstar for the week, engrossed in their award-winning lesson programs. Our teens loved Northstar’s plentiful terrain parks, including the nature-inspired “Stash,” built by snowboard-inventor Jake Burton. I loved our first bright blue view of Lake Tahoe from Northstar’s Summit Deck at 8,610-feet. My husband Greg enjoyed lunching al fresco in California sunshine (not something we do in Maine frequently). You can stay on mountain at the Ritz Carlton Northstar. We stayed lakeside at the Cal Neva Hotel on the North Shore, six ski resort are within 20 minutes. The historic Cal Neva, once owned by old blue eyes Frank Sinatra, straddles the California Nevada border, allowing for casino gambling, and state hopping within the hotel (a novelty for our kids). Every Cal Neva room has a view of the magnificent Lake, and you’re a quick drive to funky frontier towns like Tahoe City and Truckee with eateries and shops enough to occupy even the non-skier. Alpine Meadows was our next mountain. The antithesis of Northstar’s destination resort and tree-lined skiing, Alpine is 80% above tree bowl skiing, with a decidedly local “vibe.” There’s no slopeside lodging, and the best terrain is out of bounds and legal with a most liberal backcountry policy. As we explored Alpine’s multi-faced mountain, we found steep chutes and snow filled gullies on the front side, then sun-soaked bowls and Lake views on the back. Mid-mountain, The Chalet is a charming spot for a homemade lunch, with mostly outdoor seating (another indication of the desirable western winter weather). Après ski is obvious from Alpine Meadows – follow the locals, the access road and the Truckee River to The River Ranch Lodge, a wonderful watering hole since 1888 with fascinating memorabilia as proof. The River Ranch was the hot spot during the 1960 Olympics. 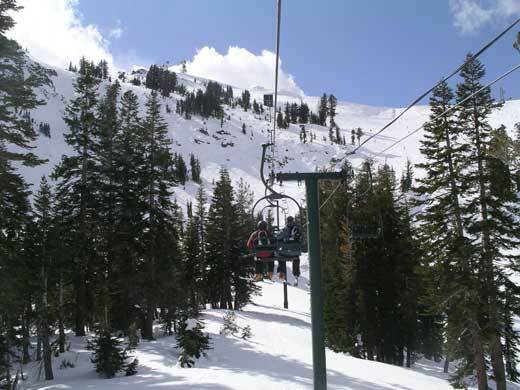 Now it’s a must for Alpine or neighboring Squaw Valley skiers, the resorts are now interconnected – called Squaw Alpine – on a shared ticket, with a shuttle bus, but the rivalry still exists – great banter over beers, hanging out over the rushing river. Our next stop was Heavenly, truly. We were eager to ski this queen of the South Shore. 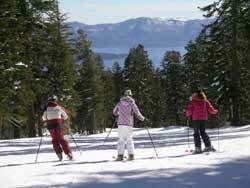 Heavenly is the largest and highest resort at Tahoe, with 4,800-acres of skiing from California to Nevada. 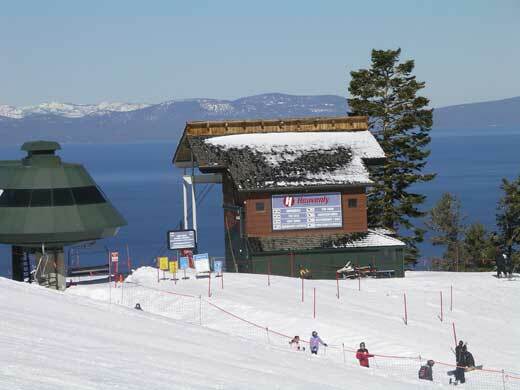 We expected Heavenly would be scenic and sizeable, with 30 lifts and four separate bases in two states. Sure enough, as we skied from the 10,040-foot summit, the sapphire hue of Lake Tahoe was an omnipresent optical oasis. What surprised us was the unbelievable tree skiing at Heavenly. When you tire of Lake views, blue sky, and blue square cruising (I never do), you can cash in on the snowy caches of glades. I can see why Glen Plake took the “job” as Heavenly’s “Ski E.O.” Don’t miss lunch at the scenic Gunbarrel Grill overlooking the Lake 2,000-feet below. 35-miles south of Heavenly is Kirkwood, on Tahoe’s map with the highest base elevation affording it the deepest, driest snow. Kirkwood’s location and double black diamond terrain thins out the crowds. 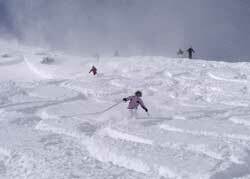 Kirkwood is known amongst experts for serious steep and deep including the legendary “Wall.” Kirkwood has ample lower mountain terrain to lure families to the 2,300-acre ski area. Interesting note, Northstar, Heavenly and Kirkwood are all owned by Vail Resorts now. 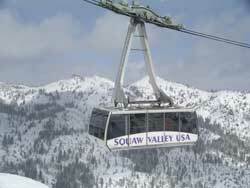 We saved mighty Squaw Valley for last, the king of the western shore of Tahoe. This legendary resort retains its history (the world’s first double chair in 1949) and international flavor, still brandishing the 1960 Olympic cauldron, rings and flags throughout the European-style ski village. 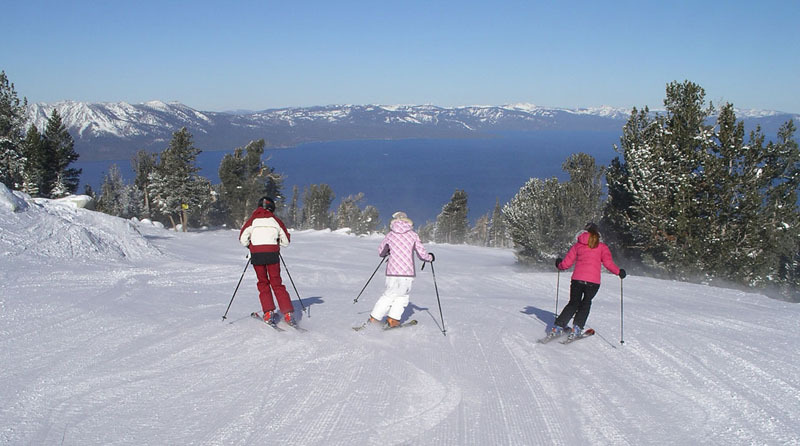 On the mountain at 8,200-foot High Camp, skiers find an Olympic ice skating rink, heated pool, hot tub and huge lodge overlooking the slopes and of course, the ever blue and beautiful Lake Tahoe. Squaw has something for everyone; swift lifts like the Funitel and Cable Car emanate from the Village to mid-mountain where the tamest terrain is located – ideal for learning families. This season, the Shirley Lake area debuts a new six-passenger lift. Experts will have a field day dropping into Squaw’s chutes, cornices and cliffs (featured in all the best ski films) from summit lifts Headwall, Granite Chief, and the famous KT-22 – named for the twenty-two kick turns it takes to ski the face. The only thing you won’t find at Squaw oddly are trail names, each area amid the 4,000-acresis designated by its lift name and a green, blue or black diamond rating (hard to get used to this vertical vagueness). Squaw offers night skiing – but the Village is equally enticing with boutiques, pubs and restaurants from Irish to sushi. Located just steps from the Cable Car, we lodged at the PlumpJack Squaw Valley Inn, a lovely property with a most unique Shakespearean motif. The whimsical PlumpJack, owned by the mayor of San Francisco, is the place for après toddies at the fireside bar, for a delicious dinner overlooking the steamy outdoor hot tubs, and the best skiers’ breakfast in all of Squaw Valley. Our tour of Tahoe revealed that each resort is unique, and worth several days exploration. In fact, you could happily stay at Squaw, Heavenly, or Northstar as one vertical vacation spot. And there are a dozen other ski areas we didn’t even hit – so we obviously have to go back. I didn’t quite get my fill of west coast sun and Sierra size snow. Tahoe is gets serious snow, you can often extend your ski season with late spring trip, and transition from turtleneck to t-shirt tan. April vacation week can be epic. Fly into Reno or Sacramento airport, and rent a 4WD vehicle, The Tahoe Basin is legendary for large snow dumps (up to 600-inches annually) and you want to be able to make it to the mountains in snowy road conditions. Travel clockwise around Lake Tahoe (72-miles total) affording uninterrupted views of the brilliant blue water. Drink lots of H2O, the arid western climate and the altitude are dehydrating. Tahoe, meaning “lake of the sky” in Native American, is 6,200-feet above sea level, one of the deepest lakes in world at 1,645-feet, so it never freezes and retains its alluring blue hue. Keep sunscreen and sunglasses on hand, and dress in layers, ready to shed.